Menthol (leaf oil) 2.59 mg. Peppermint oil (Mentha x piperita) from leaf 3.05 mg, Echinacea (Echinacea purpurea), dried juice 10.83 mg [21.5:1, QCE 232.85 mg], Peppermint (Mentha x piperita) aerial parts 14.44 mg [1.25:1, QCE 18.05 mg], Extract of Ricola’s herb mixture 14.44 mg: peppermint (Mentha piperita) aerial part 3.61mg [1.33:1, QCE 4.80 mg], lemon balm (Melissa officinalis) aerial part 3.61mg [1.33:1,QCE 4.80 mg], thyme (Thymus vulgaris) aerial part 2.18 mg [1.33:1, QCE 2.90 mg], sage (Salvia officinalis) aerial part 1.95 mg [1.33:1, QCE 2.59 mg], hyssop (Hyssopus officinalis) aerial part 1.95 mg [1.33:1, QCE 2.59 mg], elder (Sambucus nigra) flower 0.36 mg [1.33:1, QCE 0.48 mg], linden (Tilia cordata) flower 0.36 mg [1.33:1, QCE 0.48 mg], wild thyme (Thymus serpyllum) aerial part 0.14 mg [1.33:1, QCE 0.19 mg], horehound (Marrubium vulgare) aerial part 0.14 mg [1.33:1, QCE 0.19 mg], mallow (Malva silvestris) leaves 0.14 mg [1.33:1,QCE 0.19 mg]. Non-medicinal ingredients: Isomalt, sorbitol, citric acid, aspartame, chlorophyll, crisped mint oil, extract of green tea. Recommended dose: (Adults and children over 12 years of age): 1– 5 lozenges daily. Direction of use: Dissolve one lozenge slowly in the mouth every 1–2 hours up to a maximum of 5 lozenges per day. If symptoms are severe or persist for more than 2 days consult a doctor. If cough worsens, persists for more than 7 days or is accompanied by high fever consult a doctor. This product contains polyols such as isomalt and sorbitol. Excessive consumption may have a laxative effect. This product contains a source of phenylalanine in the form of aspartame and is therefore not suitable for persons suffering from the hereditary disease phenylketonuria. 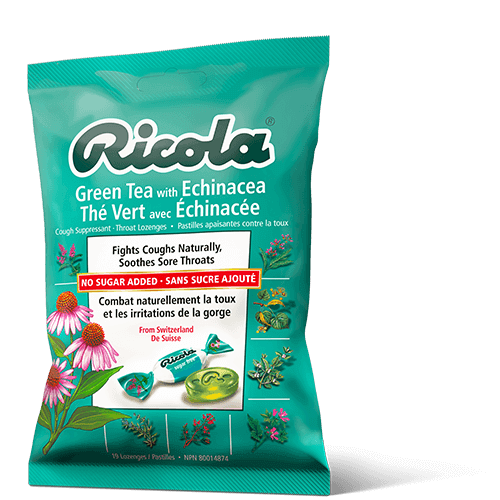 Ricola Sugar-Free Green Tea with Echinacea Cough Drops are delicately flavoured with natural green tea, Echinacea and the added goodness of mountain grown Swiss herbs. These drops are uniquely delicious and distinctly Ricola.